that will welcome into their hearts the breeze of love and joy. 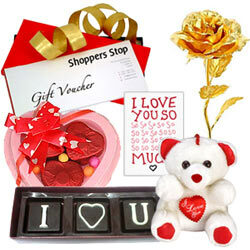 Besides this Gift Voucher you can also send 3 Pcs. Heart Shape Home made Assorted Chocolate, 1 Pack I Love You Chocolate of 25 Gr., I Love You Singing Teddy, Golden Rose and I Love You Written Card.